Anyone can tell a story, but telling a story that inspires people to change requires a different skillset. It requires craft, courage and vulnerability. It also requires the ability to share a deeper truth and to harness the power of emotion. 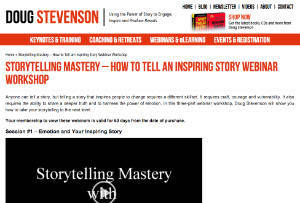 In this three-part webinar workshop, Doug Stevenson will show you how to take your storytelling to the next level.Your membership gives you unlimited, online access to view the webinar videos, and access the PDF worksheets.